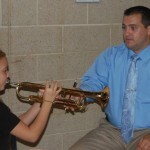 On Wednesday evening, September 5, close to 200 elementary students filled the halls of Penn Manor High School with music. Students in grades 4th to 6th were given an opportunity to ‘test drive’ musical instruments that they may have an interest in playing. 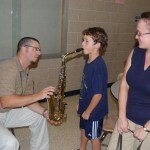 After a brief presentation, the students were free to try out their favorites with the help of district music teachers. 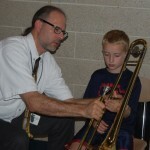 The ‘test drive’ evening allows aspiring musicians the opportunity to try instruments, and district music teachers the chance to see which instruments are a good fit for each student.